I guess this is a little proof that I actually DO give away FREE fantasy football trophies on our FantasyTrophies.com Facebook page. 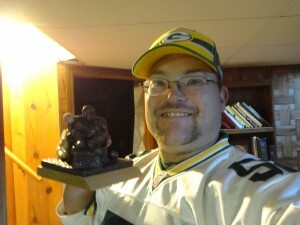 Here is Scott Wilterdink, a obvious Packers fan, with the Armchair Quarterback Mini trophy he won last week. Congratulations Scott! Previous post: Get Your Photos In For Free Fantasy Trophy!